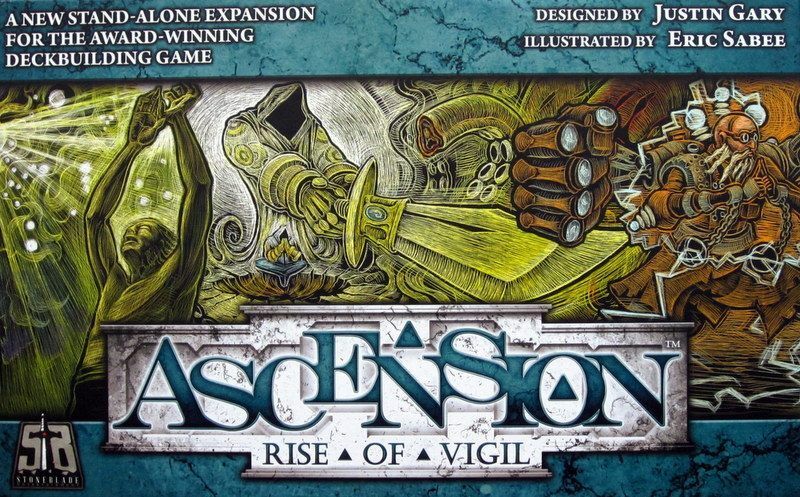 Ascension: Rise of Vigil, part of the Ascension deck-building game series, is both a standalone game for 2-4 players and an expansion that can be combined with any other Ascension game to support up to six players. Rise of Vigil introduces treasure cards to the game system, with all treasure cards in this set being "Energy Shard". When a treasure card is drawn from the shared deck, you place it in the empty space in the shared pool, then continue to draw until you reveal a hero, monster or construct to cover the treasure. When you acquire or defeat that top card, you also gain the treasure, which is added to your deck like hero and construct cards. When you play a treasure from your hand, you immediately draw another card from your deck; more importantly, you can use the energy on these cards to activate special powers on certain heroes, constructs and monsters. (Non-treasure cards can also provide energy, but they are usually worth VPs whereas treasure is worthless aside from the energy.) Energy available on a turn can be "spent" more than once, so if you have, say, two energy, then you can power up all cards with an Energize cost of two or less.